Originally this post was intended as a guest contribution for a blog focused primarily on marketing agency issues. So it was written to speak directly to agency owners and managers. Why's it published here, on a blog about B2B business development? It was rejected for publication by the target blog, yet it's a topic about which I'm passionate. So taking a bit of editorial license I've included it here. In the course of strategy, b2b inbound marketing, and business development consulting I interact with various agencies and their teams - both on behalf of my clients and sometimes as a client myself. (And have lots of experience with the latter in previous roles.) I consistently find that the land rush for technical skills to satisfy rapidly growing client demand has led to mediocrity in delivery. This is evidenced across creative, writing, technology and design disciplines - but most importantly it's reflected in the approach to work itself. It's important for agencies, and clients, that this be fixed. I’ve never run an agency and don’t aspire to. But I’ve run several businesses, hiring folks and engaging agencies along the way. And lately I’ve spent a lot of time in the orbit of folks that run successful, rapidly growing agencies. I’ve sat in a number of meetings and endured many conference calls where the discussion routinely devolved to the challenge of hiring the right people, and training them to work effectively within the agency. I’ve reached two conclusions. First, agencies need to stop worrying about finding folks who CAN do the required work, and instead focus on those who WILL. Second, you should hire as many military veterans as possible. OK. If you didn’t choke on your latte’ yet, here’s what I mean. Hiring requires finding a blend of skills and traits. There are hard skills, soft skills, personality and character traits. Each role in each agency requires a different blend of the first three. But every role in every agency demands the fourth - and that’s the one most often discounted in today’s feel good, collaborative environment. I wouldn’t be a good fit for your agency - I can hack my way through InDesign, but can’t discern one font or color from another for practical purposes. Ergo, I’m not going to be a productive designer in your office. I can write, but can barely spell my own name - and can't proofread anything! And I’m a bit of a taciturn yankee who has little patience for folks who waste my time. I probably won’t fit hand in glove with the uber upbeat tone of many growing digital agencies. But...if I promise someone something it will be done correctly, when I promised it. And in my experience, direct and anecdotal, that’s distressingly rare today. It used to be that an experienced eye could quickly review the separations to ensure they were correct, or scan a blue line proof for misspellings. Quality in today’s digital agency though carries an entirely different meaning. Now the copy itself, while still incredibly important, is merely the tip of the proverbial iceberg. The mass is invisible - the huge number of mundane details which differentiate great successful marketing from average crap. From artful and thoughtful optimization; through intelligently crafted nurturing with properly implemented progressive profiling and action based inclusions and exclusions; all the way to sophisticated lead scoring for sales enablement. The intricacies are numerous, and simply missing a link or checkbox will cripple a B2B inbound marketing initiative - often with no alert, only poor performance. But where is the training challenge? It’s never around technical skills, or even client management. Invariably the elusive elements are precision and commitment. Every basketball coach in history has reconciled themselves to the fact that certain characteristics are beyond their control. There’s a lot they can train, drill & teach….and there’s some they can’t. Of course I don’t mean race, gender or other similar categories. But there is a group which almost universally has that fundamental attribute, and which you almost certainly overlook in your recruiting. In fact you may have even institutionalized soft discrimination against this group with the placement and tone of your recruiting content. There’s an odd and troubling divide which has developed in the US between the military and creatives. (For more on it’s origins and implications I recommend this book.) You may reflexively protest, and yet I can readily cite numerous examples. A couple years ago during a keynote at Inbound, a speaker used a slide of one of his team members and her husband. It was taken at a wedding and everyone was dressed for the occasion - the gent was dashing in the dress uniform of an Army officer. But before the image had even splashed on the screen, Rand was reassuring everyone not to be alarmed because the fellow really was OK nevertheless and quite progressive in his thinking. Leaving you to ponder whether a political litmus test is a proper, or even predictive, indicator of marketing prowess - any more than, say, a screening for X vs. Y chromosomes, I ask why did Rand feel compelled to offer that justification? And why was there a palpable sigh of relief from the audience? During a recent conversation with several agency owners, my suggestion to consider hiring veterans prompted a rebuttal from the leader of a midwest agency (not the south where veterans are embraced, but certainly not the north east/west where they are sometimes scorned) about the distortions to internal wage scales of bringing folks with experience at other agencies into production roles. The idea of hiring a military veteran was such anathema that his reflexive reaction didn’t even consider it. So to use a military analogy, veterans probably aren’t even on your recruiting radar. And yet people are people. Those with military experience embark on civilian careers with the same vast spectrum of intellect, personality traits and preferences as those without time in uniform. There are natural, talented writers. There are those with an eye for design. You might not believe it, but there are even those who are extremely creative - an attribute not often associated with the military but actually quite valued in many planning and operational disciplines. And of course there are a range of professional skills which the military requires and trains. While the resumes won't announce their 'B2B inbound marketing' experience, you may find an incredibly tenacious researcher and talented writer who embraced the personal challenge of being a grunt, you’ll also find graphic designers, IT professionals and other more ‘normal’ and transferable skills. But most importantly, what you’ll find almost universally among veterans, are core character attributes which are critical to your success. Teamwork among vets isn’t a successories poster quote, it’s fundamental. A disdain for excuses is common - when it’s their task to accomplish, it must be, and will be done….right. And attention to detail and the sanctity of process is inculcated in every veteran, every day throughout their service. 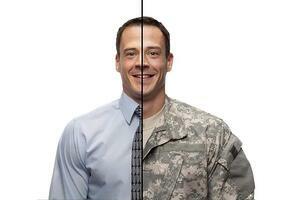 Is every vet a good fit for an agency? Silly question. Is every journalism or design major? But as you and your partners moan about your personnel challenges at least consider the possibility of hiring military veteran talent. They’re eminently trainable in the required technical skills, and they’ll bring both character attributes and a perspective to your agency which may help to elevate the performance of everyone. Start seeking veterans to join your team. Not only “can” they work, but they “will.” You’ll learn from them, they’ll contribute to the teamwork of your agency, and your clients will benefit. You may be interested in a recent article on "No Excuse Leadership" from Forbes by former Marine Corps Captain Angie Morgan of @LeadStar. She argues that leadership isn't a function of title, but rather of character. Between writing this and the scheduled publication date I came across Chad Pollitt's (@ChadPollitt) article on LinkedIn about how "going to war" imparted lessons that make him more effective in the inbound marketing agency world. It's a 'no holes barred' rough and tumble look which may be shocking to some - but also illustrates the same fundamental point.